Is your cat a tree dweller or a bush dweller? In other words, do they love to climb or do they prefer to keep all four paws on the ground? These are phrases coined by Jackson Galaxy, and they accurately represent the fact that most cats fall into one camp or the other. All my cats through the years have been bush dwellers, happy to be curled up in a cat bed, on the couch, or in both Truffles' and Tara's case, a piece of tissue paper on the floor made the best bed of all. Now there's Mudpie. In spite of screened windows to jump in, cat beds on top of bookcases, and being allowed on table tops and kitchen counters, that girl would swing from the light fixtures on the ceiling if I'd let her. It's our job as cat parents to figure out their preferences in order to create the purrfect environment for them to lead a happy, safe, fulfilling life with you. I'm always excited to hear about an entrepreneurial pet owner who has a specific need for their own cat or dog and uses that as a launch pad to create a product we can all enjoy and benefit from. 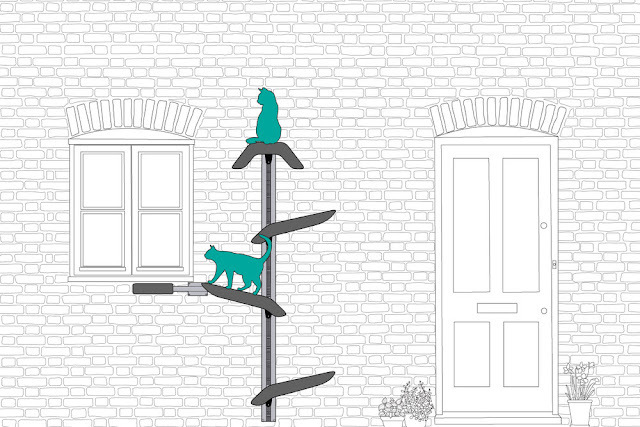 That's why I'm so happy to tell you about the Catipilla indoor and outdoor climbing frame for cats. Created with love. The Catipilla was designed by the Sutton family in the UK for their 18 year old cat Smudge who could no longer comfortably jump into their ground floor window. They started with a simple ramp and a few pedestals to help her out and when they realized how much their younger cats enjoyed playing on it as well, Catipilla was born. Enrichment for indoor cats. Catipilla can be fixed to any wall and it's sleek design combines a practical use with a polished look. The platforms will support cats of all shapes and sizes and the modular design allows you to create the perfect structure to suit your needs. The lightweight, versatile design makes the frame exceptionally easy to install and pleasing to the eye. 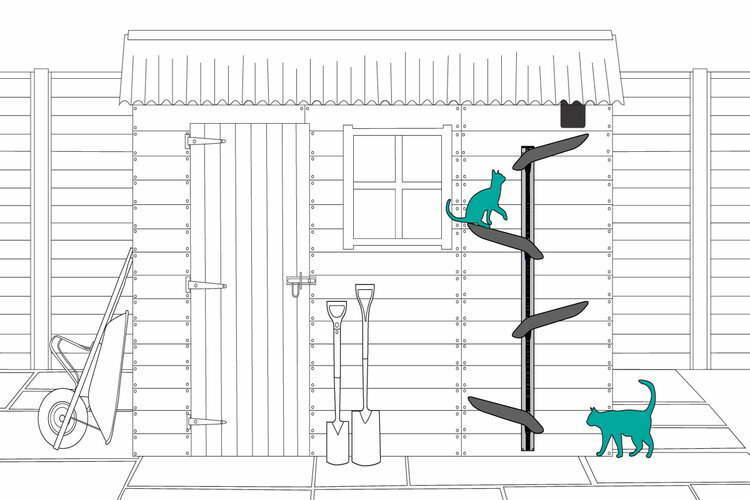 Turn your outbuildings into a kitty playground. 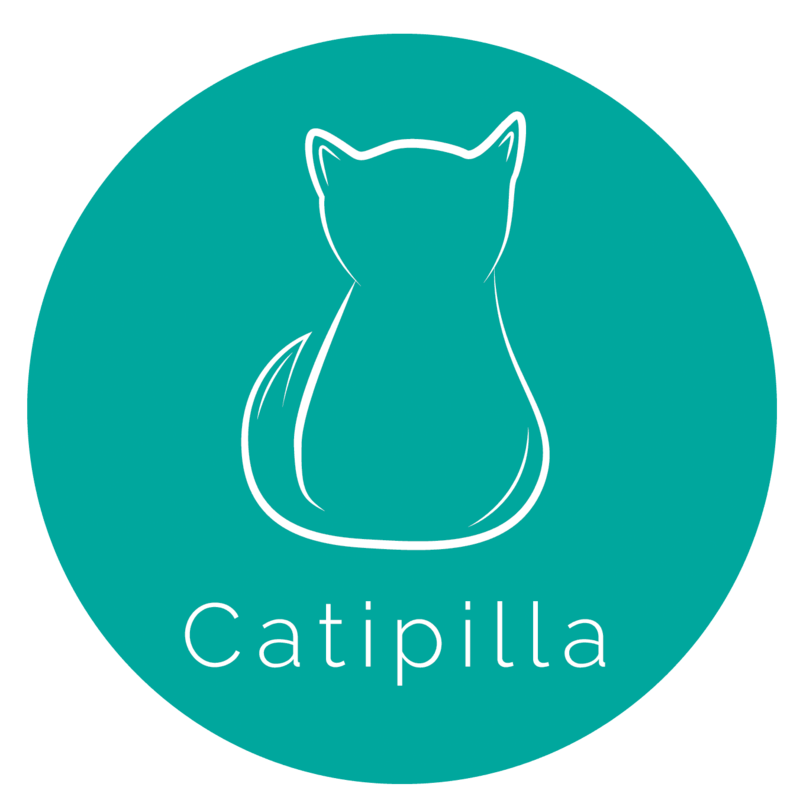 For cat-proofed gardens, screened outdoor patios and catios, Catipilla brings adventure to your cat's outdoor environment and allows them to climb and play in the safety of their home surroundings. Security. Catipilla believes they are a far securer option than any cat flap, which is inherently weak and always vulnerable to access. My neighbor closed up her cat door when she started receiving unwanted "visitors". The Catipilla Tread Plates are designed to support the weight of a domestic cat only. Should anything heavier step on them, they will slowly slide to the bottom of the pillar. Cat flaps are also an open invitation to burglars. Not only does cutting a hole seriously compromise a doors physical integrity, cat flaps can easily be used as a "fishing hole" by using rods to reach keys, bags and valuables without ever entering the home. Obviously, safety precautions still need to be kept in mind and windows should never be left open when you're not home. And while I would install the Catipilla indoors to literally let Mudpie "climb the walls", if you allow your cats outside please don't leave them unsupervised. 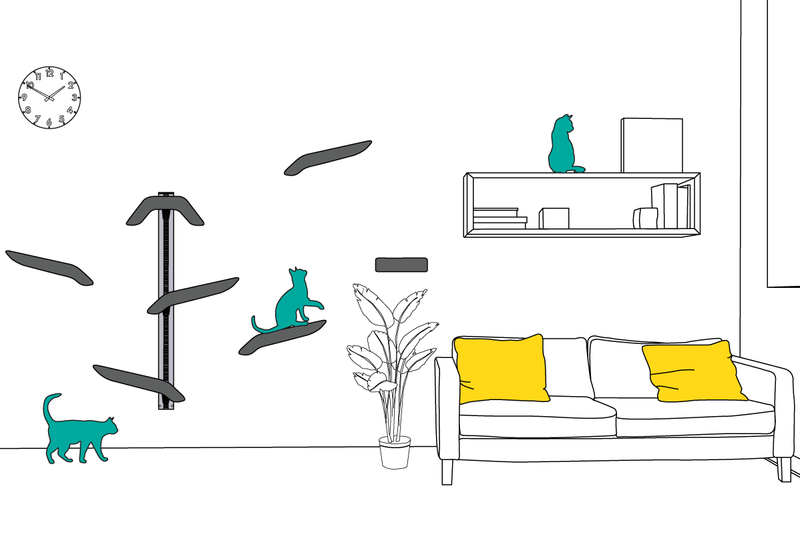 Thanks to fun and innovative products like Catipilla, everyone can make their home a kitty paradise! Catipilla is launching their Kickstarter Campaign on April 10th. For now, there is a demo page in place so you can browse the rewards and exclusive offers. If you want to keep up to date with everything Catpilla until then, follow them on Facebook, Instagram and Pinterest. Disclaimer: This post is sponsored by Catipilla. I am being compensated for featuring this content but we only share information we feel is relevant to our readers. Oh, this looks like it was made for little lady Eddy over here. And it sounds like she and Mudpie have a bit in common, the cute little monkeys that they are. Thank you for sharing this pawesome product with us! Those things are quite fun looking. That looks really cool! I like that you can customize it for your cats. Our cats are strictly indoors these days, but the cat-flap alternative is a neat idea too. What a great way for us cats to climb. Wow, that Catipilla is so cool! We know some kitties who would love it! Totally brilliant!! We aim to help fund this as it is just so amazing and special!! A great review and I hope we get this Kickstarer to the finish line! !